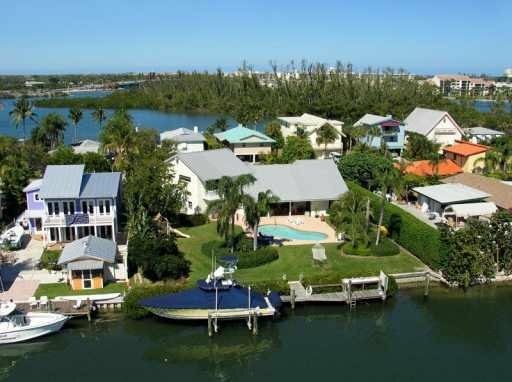 Yacht Club Estates is located near the Jupiter Inlet and has great views of Sawfish Bay and the Intracoastal Waterway. The neighborhood consists of 63 single-family homes that range in size from 1,000 to 3,400 square feet of living space and one to four bedrooms. Residents do not have to pay monthly homeowner's association fees. Convenient to shopping, dining, golf courses and beaches. Zoned for A rated schools. Best waterfront location in Jupiter with expansive views of Sawfish Bay and the Jupiter LIghthouse. This charming Key West style property features ''A frame'' construction providing soaring ceiling heights with dramatic exposed beams and tongue and groove ceiling detailing. Multiple docks will allow for up to a 60' boat with deep water access and no fixed bridges. Property has city water and sewer, but has no deed restrictions or HOA fees.